I dinner at my uncle house as they are having steamboat for the reunion dinner. After the dinner, was the birthday celebration for niece Ka Yi, my cousin purposely bought an jelly cake from KL and driving all the way down to Teluk Intan. Bear shape birthday cake. Made by whole jelly. [My nephew] Don't touch! Don't eat! So small already start to play handphone. At 10pm, we have a gathering of secondary school friend in Al-Fresco to discuss the birthday celebration for our friends, Loo Yee and Ai Ling. At there, I met some 'long time no see' friend and 'one year see one time' friend. Unexpectedly, Loo Yee and Ai Leng really shocked of that surprise. And this have to thanks for the one who planned it. Lol. Many of us, having fun until 5am in the morning. Still, we are not tired. As usual, we reserved the 1st day of Chinese New Year to visit our relatives. With less than 4hours, woke up at 9 o clock. Have small amount of breakfast. Is time we go again! Pacman biscuits? Of course not! That is fortune cookies. There is a message for me. The naughty kid yelled at me while I trying to snap his photo. Wines are not neglected during CNY. Finally it comes! The rhythm of dancing lions! From my neighbour's house! This year it come a day later compare to last year. It woke me up and I dragging my body out to watch the dancing lion show. Dancing lion, played by my secondary school junior. Hey lion, do you know playing that kind of fire cracker is illegal? Still play till so syok. Going to leave, bye bye. I know some of you are waiting for my blog update. But, you all still have to wait. Lol. I will update it all 'sekaligus' when I back to Melaka on Saturday. The results for this sem is unsatisfactory, make me have the insomniac last night. Woke up 12 something this morning. Think to have McDonalds breakfast right after wake up, but it already over 11 o clock. So I decided to have my meal at another place. Went to one of the stall in front of the house in Jalan Woo Saik Hong. 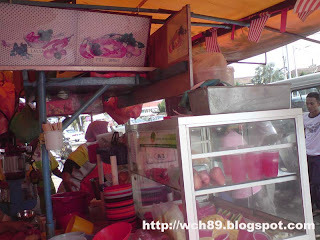 This stall is well known in among the residents in Jalan Woo Saik Hong. 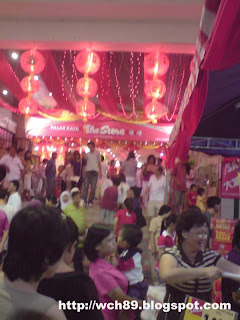 The stall owner being called 'Ah Sou' by people. The stall is famous with its curry. The curry hor fan I ordered. Really delicious! Mummy said she want to eat laksa. So I 'da bao' (take away) a pack of laksa from Lo Hon Go for her when I back. 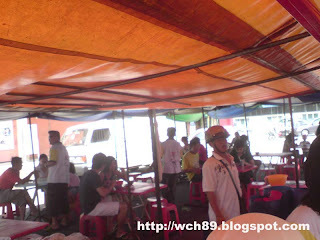 Lo Hon Go is a famous place for the resident in Teluk Intan. 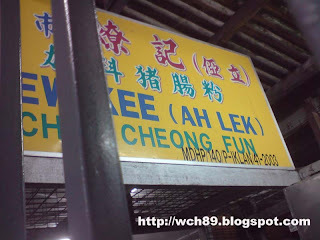 It is famous with its laksa, mee rebus, ice kacang, hawaai and some other ice desserts. There was many people that time as that time is lunch time. I waited about 15 minutes. The place they prepare the food. They also sell some fruits and jelly. The decoration of the stall. Counting down for Chinese New Year! It is reunion day tomorrow. 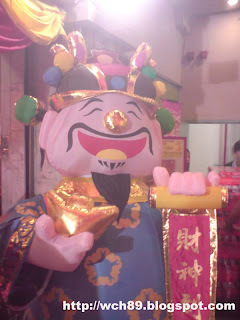 Wish you all have a prosperous and wonderful Chinese New Year! Woke up at 1 o clock something yesterday. Plan to have Rojak(mixed fruit) after my brunch. It was a hot sunny day. 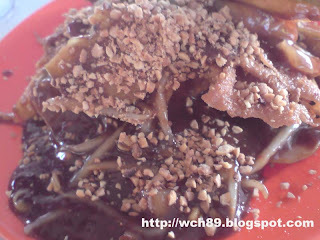 Rojak Ah Chai is located accross the road of my primary school. So I told my mum I will fetch my youngest brother from school after having rojak. 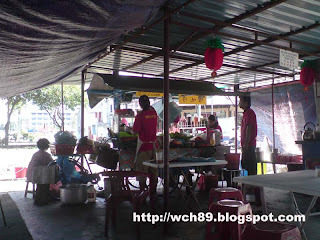 Here is the Rojak Ah Chai stall. No fan no air cond, but I didn't feel so hot. This is the main character, Rojak. Inside have crispy prawn cracker and it is nice to eat together with the rojak sauce. Yum! It is good to have a chilled coconut drinks together with rojak. The clock strike at 12. Stomach got a bit hungry now, it is time for super supper! 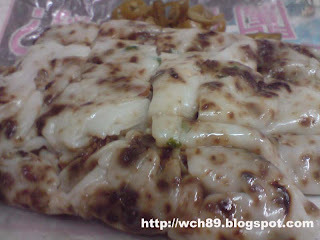 Hmmm, think to have char kuey tiao, but that is heaty and I just recovered from fever, didn't want to get the second time. >.<. 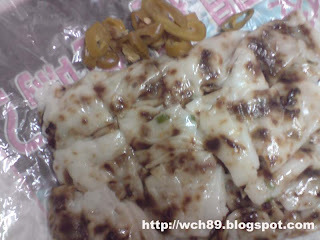 Ok la, I go to buy one of the famous food in TI ----> Deng deng deng, Chee Cheong Fun! 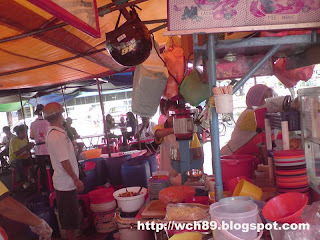 No one in Teluk Intan doesn't know this. 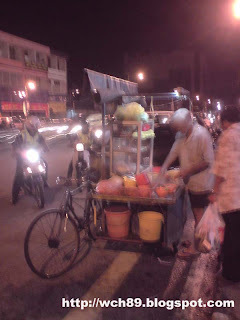 It was 12 something when I heading back after buying the supper. 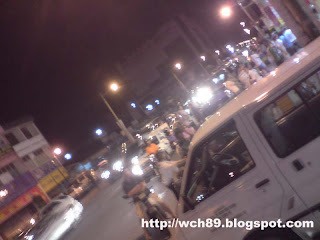 The town was jam and it is really very hard to see a jam after 11 o'clock. I just find a parking go down to buy something. From the information of my friends who work there, The Store operate 38hours continuously since 17 Jan 10.00a.m. That is the first time I hear it. See the polices beside there? They also have to OT to ronda the town. 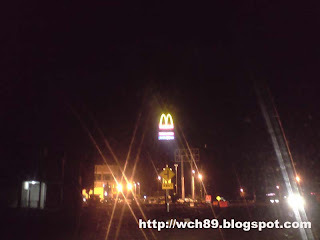 On the way driving back to home, I can see new opened Mcdonalds from far. I reach home finally. After keeping chocolate and orange juice into the fridge, is time to start eating! The chee cheong fun not only look good, but also taste good. Don't say I boast la, you see yourself. I still not feel this is a happy holiday for me so far. Getting ill on the way I coming back and soon turn to be high fever. Oh gosh! That is really suffer man! Feel like having winter season around me. It is just like what my friends who study oversea feel, I can feel how cold are them now. Jacket, blanket, hot water, pills..........Even have to care my mouth also, cant eat heaty food and control myself not to play computer. Luckily all this has gone yesterday. And now to the world: I AM BACK! Wahahaha! "Some" of the food we had ordered. Sashimi (don't know what name), got Salmon leh! Unexpected this restaurant got Sakae. Ordered the cold one. This little umbrella come together with the Macha Ice Cream. It has many function you know? Below is one of the example. Taking photo while waiting them to try the clothes. Have this plate of roasted duck and BBQ pork rice from one of the famous shop of roasted meat in Batu Berendam. The look is not bad. I know it is not so nice compare to my hometown one when my tongue communicate with it. But what can do? Dinner at 9 o clock. Waiting for holidays @ sem break!